Historical content: I wrote this article over 8 years ago on 2008-12-01. You are viewing an archived post from my old WordPress blog. The archive contains over 1,600 articles written over a ten year period. The formatting and contents of the posts may not display perfectly. You can build cross-platform GUI applications in Python using a library called PyQt, a set of Python bindings for Nokia's Qt application framework. Using PyQt, you can create Python applications that look and feel like native applications regardless of whether they happen to be running on Linux, OS X, or Windows. The application files themselves, however, do not look like native executables; they are simply Python files and require Python, PyQt, and other dependencies to be installed to run. Needless to say, you cannot distribute your applications in this manner unless your target audience is entirely comprised of alpha geeks. To provide a usable user experience that is consistent with native applications, you can bundle PyQt applications into native executables for each of the platforms you're supporting. When deploying on OS X, for example, you can bundle your PyQt application into a standalone OS X application bundle. This process, which involves the use of the excellent py2app application, comes with several gotchas that I hadn't bargained on. Specifically, you cannot build standalone application bundles with the system python in OS X using py2app. 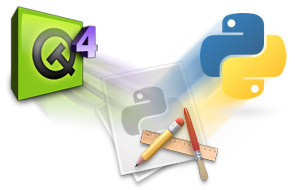 If you want to build standalone PyQt apps, I recommend setting up Python, PyQt, etc., under MacPorts. If you're comfortable with Terminal and don't need to be spoon fed, here's a quick overview of how to get your system in shape to compile standalone OS X application bundles from PyQt apps using py2app on Leopard 10.5.5 (which happens to be the only operating system version I've tested this on; this may work on other versions of OS X but YMMV). (If you need step-by-step instructions, see the Macports installation details section, below). Install MacPorts. You will be installing Python, PyQt, py2app and everything else you need under MacPorts and using that environment for everything. Install the following portfiles: python25, py25-macholib-devel, py25-sip, py25-pyqt4, py25-py2app-devel, py25-pyqt, python_select. Note that I am installing the -devel version of py25-py2app, as well as py25-macholib-devel on purpose. I couldn't get it to work with the stable versions. You may have to deactivate py25-macholib if it gets installed automatically as a dependency for py25-py2app-devel (this is what I did, but I'm assuming that installing py25-macholib-devel before py25-py2app-devel should mean that you won't have to). Note that the includes array contains sip and PyQt4._qt. Those two entries are essential if you're bundling a PyQt app. That's it. Double click on your app, which you can find in the dist folder and it should run. If you run into any problems, see the My Macports setup section, below, for an exact dump of my Macports portfiles that you can use to compare (obtained using port installed). Read on if you want to the full story and details of how I got my system up and running with MacPorts to deploy OS X app bundles using PyQt and py2app. I'm including this with as much information (error messages, etc., as possible so that others may find this post if they're similarly stuck.) Or, if you're not interested, you can jump to the Reference section. My initial attempt at creating a standalone PyQt app with py2app resulted in the app crashing on launch. Unfortunately, doing that caused the app to crash at launch. It was only when I actually read the output from py2app that I noticed that it appeared to be creating a semi-standalone app instead of the standalone app that I asked it to create. In retrospect, I should have realized this from the very first error since I should not have gotten a version mismatch error on the Python interpreter if it had been correctly embedded in the app bundle. [py2app] refuses to build a standalone bundle out of the system framework. First of all, if you want to build bundle .app's that are redistributable, it's a good idea not to use the system Python, especially if you want to support Tiger (10.4). There are things in Apple's Python (i.e. DTrace support) that I imagine won't play nicely on an older OS. At this point, I knew that I had to install a separate Python and decided to use MacPorts. It did take a while to install everything but that approach paid off in the end. Target org.macports.activate returned: Image error: /opt/local/bin/a2p is being used by the active perl5.8 port. Please deactivate this port first, or use the -f flag to force the activation. It appears that there were two versions of PERL installed. I simply restarted the installation (sudo port install py25-pyqt) and, after waiting a long while, and having to restart it once more, it completed successfully in installing Qt and PyQt. I've build a binary with py2app, but PyQt4._qt is pulling redundan't Qt components like QtDesigner, xml, dbus, network etc. which app doesn't need. only QtCore and QtGui. If I remove PyQt4._qt from the list then the binary is small, but it doesn't want to work, as it doesn't find PyQt4._qt :) Is there a way to exclude unneeded PyQt4/Qt4 components without breaking the build? Thanks for this guide, however…! 1) Building Qt & PyQt via MacPorts is currently broken, but it's quite easy to workaround. 2) I have the same problem as riklaunim. Before I followed your guide, I had installed everything by myself (Qt .dmg bundle from QtSoftware), compiled sip and PyQt… And it was enough to import individual PyQt4.s in my app. Then py2app picked up only the frameworks needed. But with your guide, it doesn't pick them up unless I import PyQt4._qt. I don't get it. When I try specify the frameworks by hand in setup.py, the frameworks cannot be found. Eh. thank you aral. do you happen to have _any_ solution to the plugins dependency problem (i.e. the fact that plugins do not correctly get linked, and for instance using webkit to display pages will result in images not showing)? BTW, if you are trying this now, you'll see an error trying to install py25-macholib-devel, but I found that if install revision 46161 of serf after python25, then py25-macholib-devel will build and install OK.
Hmm. I'm stuck sudo port -v install py25-pyq results in Error: Port py25-pyq not found To report a bug, see How did you make that?